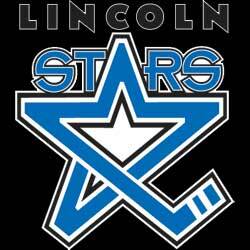 It was an another up and down weekend for the Lincoln Stars as they were shutout Friday night at the IceBox by the Dubuque Fighting Saints by the score of 1-0, but rebounded Saturday evening with a 3-2 OT shootout win against the Waterloo Blackhawks in Waterloo, IA. The Stars currently have a record of 7-12-3 (17 points) and are in seventh place in the USHL western conference, six points behind the sixth place Sioux Falls Stampede, and two points ahead of the eighth place Waterloo Blackhawks. Click here to view the current league standings. Former Stars goaltender Jacob Nehama, who was cut from the team at their tryout camp this past June, got some revenge in a Fighting Saints uniform as he stopped all 34 shots he faced to shutout his former team. Dubuque was missing so many players in this game due to injury or suspension, they called up a number of players from their affiliate roster, and actually were able to "loan" two forwards from the NAHL in order to fill their roster. Despite all of the new faces, the Fighting Saints put a blanket on the Stars and really limited the amount of quality offensive chances they had in this game. Yes, the Stars had 34 shots on goal, but many of those shots were not high quality. Time after time, the Stars would enter the zone and get one shot on goal before the Saints gained possession of the puck and moved the puck right back out of their zone. Lincoln very rarely were able to sustain offensive pressure in the Dubuque zone, especially in the first two periods. It's well known that the Fighting Saints play team defense better than most teams in the USHL, and it was certainly on display this past Friday night. I thought the Saints did a great job getting between the puck and their goaltender when the Stars had possession of the puck. Many shots from Lincoln were blocked or deflected. The lone goal came early in the first period when Saints forward Mitchell Smith beat a Stars defenseman to the outside before skating in on Cam Hackett and roofing a shot glove-high. There wasn't much Hackett could do on the play. I thought Dubuque was the better team overall through the first two periods, but Lincoln certainly played with more urgency in the third period. But Saints goaltender Jacob Nehama stood tall in the final twenty minutes when the Stars threw everything they had at him. At the final horn, Nehama skated out of his crease and pumped his right hand up and down as he was mobbed by his teammates. I'm sure he was pretty happy to prove people wrong. As well as Nehama played that night, I thought Stars goaltender Cam Hackett played even better. Hackett definitely had tougher saves to make throughout the match compared to Nehama. Hackett stopped 28 of 29 shots on goal, and was the only reason the Stars were a shot away from tying this game. Lincoln went 0-for-4 on the powerplay in this game, while Dubuque went 0-for-2. The Stars are getting better with moving their feet more to draw penalties. However, Lincoln's PP unit really struggled most times. In this game, they were lucky to get the puck into the Dubuque zone and set up. Most often there were met at the blueline with a line of red jerseys and were forced to dump the puck in. Again, give credit to the Fighting Saints who put on a clinic on how to effectively play unselfish team defense. It wasn't exactly pretty, but the Lincoln Stars escaped Waterloo, IA with two points after a 3-2 shootout victory against the Blackhawks. This was one weird game to watch. I'm not sure where to start. Lincoln was very, very lucky to get two points. Thanks to a number of calls against Waterloo in the first period, the Stars got on the scoreboard first with a 5-on-3 PP goal scored by Patrick Polino. Polino accepted a pass from below the left faceoff circle in the Waterloo zone before firing a sharp-angle shot that got past Blackhawks goaltender Trevor Gorsuch. The Stars extended their lead to 2-0 in the second period thanks to another powerplay goal, but this one came from forward Joe Lappin. On the play, forward Miguel Fidler brought the puck from behind the net out front in a stuff attempt. The Stars immediately crashed the net and Joe Lappin was able to bat the puck into the net on the goal-mouth scramble. At the end of the second period, the Stars held a 2-0 lead and seemed to have all the momentum on their side heading into the final twenty minutes of regulation. Shots were 21-20 in favor of Waterloo through two periods. Waterloo scored two goals in the third period to knot the game at 2-2, and outshot Lincoln 16-1. Yes, the Stars had one shot on goal in the third period and that lone shot on goal came with 35 seconds remaining in regulation. I've been watching Stars hockey for a long time, and I don't think I've ever seen them just stop playing as they did in the third period of this game. It was hard to watch. Waterloo players were skating hard to pucks, while Lincoln players floated around in a daze. After a scoreless five-minute overtime period, this game went to a skills competition to name a winner. Stars goaltender Cam Hackett stopped all four shooters he faced, while Grant Jozefek scored the only goal in the shootout to give Lincoln the 3-2 win. Lincoln went 2-for-7 on the powerplay, while Waterloo was 0-for-4 with the man advantage. An encouraging stat: Lincoln has not given up a powerplay goal in four straight games (8 powerplay chances against in those four games). Stars are also limiting the amount of times they are shorthanded per game, also. Once again, Hackett saved Lincoln's bacon with a number of big saves in this game. Without his consistent play, this is another third period collapse. Hackett stopped 37 of 39 shots on goal in regulation and OT, along with the four shooters in the SO. I mentioned this on Twitter last night, but Hackett has established himself as the clear #1 goaltender as of late with his play. He wasn't always consistent in his play during the first couple of months, but he has really turned it on. In his last six starts, Hackett has stopped 205 of 218 shots on goal (.940 save percentage). His win loss record (2-4-0) in those six games isn't the best, but that's because Lincoln averaged 1.67 goals scored. He's standing on his head, but not getting much offensive support. The Stars found a way to win in the end, but I'm not sure I've seen a team flip the switch as much as the Stars have done so many times this season. They are very Jekyll and Hyde. The first two periods of this game, Lincoln showed that they were the better team. In the third, they just stopped playing. The consistency issue continues to be a problem. Stars had a 2-0 lead going into the 3rd period against a team that was 1-11-0 in their last 12 games and were missing their top 3 forwards (Boeser, Sheehy, Novak). They never should have allowed Waterloo back in the game. There's no excuse to stop competing. There's no killer instinct with this team. The Stars had 7 powerplay opportunities to Waterloo's 4, and Lincoln was still outshot 39-23. I hate to sound negative after win, but that's not a good stat at all. With the amount of PP chances that Lincoln had in this, the Stars should have outshot the shorthanded Blackhawks, or at least kept it close. Hopefully the Stars can learn a lot on how not to play based on their performance in the third period. Learn from it, and move on. Hopefully next time they have a third period lead, the Stars can keep a boot to the throat of their opponent. Lincoln will have one more game to play before the holiday break, and that will come this Friday in Sioux City, IA against the Musketeers. The Muskies are the top team in the west, but the Stars have done pretty well against them so far this season, going 2-2-0 in four games. Gotta feel a little good for nehama. Bet he was beyond motivated to get that shutout.